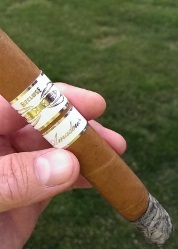 1) Iconic Leaf has announced an extension to its Recluse line of cigars called Amadeus. Select retailers will receive pre-IPCPR shipments of the product, which features a Connecticut-seed Ecuadorian shade wrapper, a proprietary binder, and a filler combination of Dominican and Connecticut tobaccos. A press release issued by Iconic Leaf describes Amadeus as “rich and flavorful with a smoothness that is undeniably Recluse.” There will be six vitolas—three box-pressed, and three of the Sidewinder variety (a format pioneered by Iconic Leaf that’s a flattened oval with a slight box press and a bit of a taper at the cap). Amadeus appears to be the company’s first attempt to capture some of the milder premium cigar market. Iconic Leaf launched a few years ago and has kept the identities of its principals private. 3) Inside the Industry: D’Crossier is introducing a new line called Golden Blend Series featuring Nicaraguan and Dominican filler that is comprised 40% of tobacco aged for ten years. The Costa Rican-made cigar has an Ecuador wrapper and Costa Rican binder and comes in five sizes: Robusto, Torpedo, Taino (6.5 x 54), Churchill, and Double Corona. 4) Around the Blogs: Stogie Review reviews L’Atelier Extension de la Racine. Cigar Fan fires up a Cain Daytona. Cigar Inspector inspects the Punch Ninfas. Leaf Enthusiast checks out the Nica Rustica by Drew Estate. 5) Deal of the Week: Famous Smoke Shop has a variety of coupons available ranging from $10 or $20 off (orders of $100 and $200, respectively) to free five-packs and free boxes. The coupons can be combined with sale items or even constantly updating Cigar Monster deals. Thanks for the interesting new. I’m really looking forward to taste the new Golden Blend Series from D’Crossier, the mix sounds like something I will like. Yeah. And I like Recluse, so I'll be trying Amadeus for sure.